Scott Adams of Dilbert fame says that the need for management is on the decline. Gail Vaz-Oxlade has some advice for investors whose stomachs churn as their portfolios go up and down (in a post no longer online). Her advice is sensible enough, but I worry about telling people to lighten up on stocks if they are worried. The problem is that they will be most worried when stock prices are lowest. Maybe a better answer is to write a letter to yourself explaining how worried you are. Then when stock prices recover, read the letter and decide to lighten up on stocks while prices are high in anticipation of the next drop in stock prices. The Blunt Bean Counter explains some of the pitfalls of making a housing loan to your married children even if you formalize the loan. Million Dollar Journey looks at how the federal budget affects small business owners. I’ve been quite critical of the investing strategy called value averaging (VA). I’ve explained the reasons why it doesn’t work, and why the methods used by its proponents to measure its returns are flawed. One reader, Lost Cowboy, challenged me to dig deeper, and I’ve done that with some experiments. In short, value averaging is a strategy where you choose some target investment return and buy or sell as necessary to keep your dollar-value in equities rising by this target percentage. If equities rise on their own by more than this target, then you sell some, and if they rise by less than the target, then you buy some. The theory is that this will force you to buy low and sell high. In practice, this strategy demands that you invest cash when you don’t necessarily have it available. Solutions to this problem severely undermine returns. I dug up some historical U.S. S&P 500 stock returns, short-term interest rates, and inflation rates from Robert Shiller’s online data. I used data from the last 100 years to compare dollar-cost averaging (DCA) and value averaging (VA). In this context, DCA just means investing money when you have it. I assumed that an investor invests $1000 each month (adjusted for inflation) in today’s dollars. With VA, things are more complex. You have to decide on a return target and decide how to handle the case when the strategy calls for investing cash you don’t have. I decided to try all return targets from 0% to 20% per year in 0.5% increments. I also decided that there would be no leverage. So, we begin with some cash on the sidelines that is available for investing if necessary. For example, if we target 20% cash on the sidelines, then only $800 per month gets added to the target for stock ownership each month. Of course, the actual allocation to cash will fluctuate based on how actual stock returns differ from the target return. I also credited the cash on the sidelines with interest based on Shiller’s data. I tried cash targets of 0%, 10%, 20%, 30%, 40%, and 50%. Whenever the VA strategy calls for investing more cash than is available, we just go for 100% allocation to stocks and no cash on the sidelines. So, each month we add a fraction of the new $1000 to the VA portfolio target for stocks, increase the VA stock target by the target return percentage, and then adjust the allocation to stocks in the actual portfolio. I ran the VA portfolios for 25 years, with a reset of the target allocation to stocks every 5 years. There are 901 rolling 25-year periods over the last 100 years, and I ran VA simulations for all of them. For each target return and target cash percentage I averaged these 901 portfolio runs. For the DCA case, I just had to run the 901 25-year simulations once and average them. I did not take into account any trading costs, MERs, or taxes. 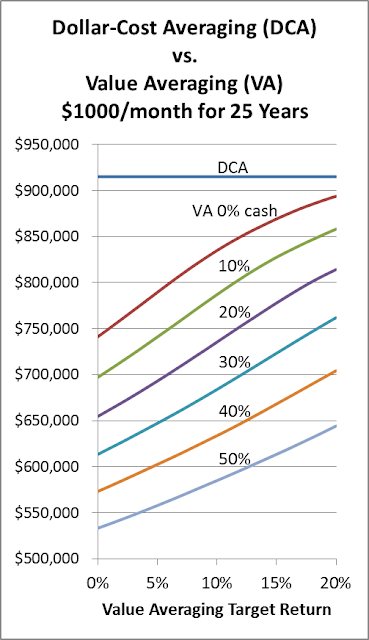 Taken together, these costs tend to hurt the VA portfolios more than the DCA portfolios. You’ll notice that for the 0% cash case and high target returns, VA seems to get close to DCA. This is because for a sufficiently high return target, VA and DCA do the same thing. With an extremely high return target, VA never takes any money out of stocks, and both VA and DCA just put the $1000 into stocks each month. As we lower the return target, VA occasionally takes some money out of stocks when stock prices rise sharply, and this hurts returns. The main takeaway from these experiments is that it has been good to be invested in stocks for the last 100 years. Despite the apparent logic of value averaging to cause investors to buy low and sell high, the opportunity cost of sidelined cash dominates any benefits. You’re better off to choose an asset allocation and stick with it than to try value averaging. Andrew Hallam is promoting value averaging again. This is an investing strategy that involves choosing a pre-determined rate of growth for your portfolio and then either making up the difference when markets disappoint or taking money out of the market when returns exceed your expectations. It doesn’t work. Several months ago I explained in detail why value averaging doesn’t work. A quick summary: you have to have a pile of cash on the sidelines available to pour into the market if needed. Either that or you have to borrow deeply if the cash isn’t available. Value averaging proponents calculate their strategy’s returns using the “internal rate of return” (IRR). The IRR can be a good way to measure returns, but in this case it means that we ignore the opportunity cost of idle cash and ignore the interest costs on borrowed money. Hallam gives some results over a period cherry-picked to make value averaging look good: the 5 years from February 2008 to January 2013. Note that 2008 was the year the market crash began. Let’s say that you had $500,000 invested in U.S. stock index ETF VTI on 2008 Feb. 1 and began value averaging with a 9% per year return target and making adjustments each month. By the beginning of March 2009, you would have borrowed a total of just over 363,000! It’s ridiculous to think that investors would have had this much cash on the sidelines or would have had the nerve to borrow this much to buy stocks while they were crashing. It’s equally ridiculous not to count the opportunity cost of cash on the sidelines or borrowing costs. Are the return figures quoted by Hallam based on Ramsey’s suggestion to do nothing when you’re out of cash or are they based on borrowing hundreds of thousands of dollars? If they are based on the borrowing, does he factor in interest costs? Does he seriously think that investors should leverage themselves in this way? Value averaging is a bad idea that sounds appealing until you really crunch through some numbers with real-life scenarios. Retire Happy Blog explains in full detail how to calculate your CPP retirement pension. I’ve been looking for this for a long time. Every other explanation I’ve ever seen leaves out a lot of necessary detail. Dan Hallett reports that BMO is cutting the distributions on some of their income funds. This was inevitable. Investors’ dreams of indefinitely collecting income that exceeds investment returns are becoming nightmares of eroded principal and reduced income. Canadian Capitalist says that the problem with TekSavvy’s internet and telephone offerings is that they are too dependent on Bell to do timely service work. Big Cajun Man got a $113 RRSP account fee reversed. The Blunt Bean Counter has a more comprehensive list of questions to stress-test your finances and see if your estate is ready if the worst happens to you. Tom Bradley at Steadyhand finds the current consensus that interest rates will stay low for the next few years to be extreme, and he thinks we should be preparing in earnest today for possible rate increases in the future. Preet Banerjee says you should set aside time each year to call up all your providers of cell phones, insurance, internet, etc. and try to get your costs lowered. My Own Advisor discusses three of investors’ biggest enemies. I think he hit the biggest problem spots. Million Dollar Journey takes a look at Vanguard Canada’s line-up of low-cost ETFs that are bringing down the average cost of Canadian ETFs. We’ve been treated to a long-running battle between Jim Flaherty and mortgage lenders over the length of mortgage amortization periods and low mortgage interest rates. I wonder why we can’t just have a market-based solution. I don’t mean this in the same way as some critics of Flaherty who call for him to leave markets alone. Mortgage lenders lay off much of their risk to the Canada Mortgage and Housing Corporation (CMHC), and CMHC charges mortgage loan insurance premiums that make no sense. As long as this situation persists, we can’t just let the lenders go crazy lending to anyone with a pulse. This brings up the question of why CMHC premiums make no sense. The rules for calculating the premium you have to pay with your mortgage fit on a short web page. The premium amounts don’t take into account important factors such as the current ratio of house prices to rents. This guarantees that the premium you pay has little relationship to the real risk of default. It wouldn’t be too hard to come up with a better set of rules for calculating CMHC premiums. If they properly took into account how hot the real estate market is in each part of the country, there would be less need to rein in mortgage lenders. If premiums were to rise sharply in very hot markets, the added cost to borrowers would dampen their enthusiasm. If buyers kept buying anyway despite the high premiums, at least CMHC would be collecting more money to offset the higher risk of mass defaults. Is there some reason why CMHC can’t charge rational premiums for mortgage loan insurance? According to Will Dunning, Chief Economist at the Canadian Association of Accredited Mortgage Professionals (CAAMP), as quoted by Canadian Mortgage Trends, “190,000 jobs will be lost between 2013-2015 due to the maximum [mortgage] amortization being cut from 30 to 25 years.” Apparently, people making their living building and selling homes are in for a rough ride. However, this is an inevitable outcome of the necessary reining in of Canadian real estate. This 190,000 figure is split between “70,000 lost jobs in the new build market and 120,000 in the resale market.” Let’s look at new housing starts first. CMHC has historical housing start statistics going back to 1955 showing housing starts over the last decade well above the long-term average. As for home resales, CREA has statistics on recent home resale showing that home resales are perhaps just slightly above long-term average figures. However, these above average sales levels are happening at a time when prices are very high (see the chart in the Canadian Mortgage Trends article). So we have come through a period where the number of homes sold is high and home prices are very high. Multiplying these figures together gives the dollar-volume of sales, a percentage of which gets paid to people employed in real estate in one way or another. The only way to preserve this income and thereby preserve the number of jobs in real estate is to keep the party going just as hard as it has been going. We would need to keep loosening lending standards and further lower interest rates to draw ever more people into buying homes they can’t afford at ever higher prices. This approach is clearly unsustainable. It gives me no pleasure to say this, but job losses for people connected to real estate are inevitable. We can delay it for a while, but that would just make the eventual job losses even more sudden and painful. The federal government’s approach of trying to let the air out of Canadian real estate slowly makes sense. We can have a sensible debate about what actions the federal government should take, but it can’t start with taking the currently inflated number of jobs connected to real estate, treating it as a baseline, and complaining about any drop from this point. Scott Adams of Dilbert Fame has some harsh words for the whole field of the “science” of management, success, and leadership. He makes a lot of sense when he says that what we think of as the cause of success may actually be just the result of success. It’s like thinking that driving an expensive car makes you rich. Rob Carrick brings us a detailed guide showing how to ditch your advisor and take control of your own investments. Canadian Couch Potato looks into the difference between the market price of exchange-traded funds and the net asset value of their underlying securities. Million Dollar Journey gives us a peek at what he holds in his RRSP. Retire Happy Blog tackles a reader question about whether to pay the deferred sales charge to get out of an expensive mutual fund. Big Cajun Man says that passive investing doesn’t mean lazy investing, and he has been studying up on some of the ETFs he owns. He also has a very colourful description of how his career as an active investor was less than perfect. The Blunt Bean Counter has a guest writer who says that lawyers often fail to cover RESPs when they draft wills. With 5-year Canadian bonds paying about 1.2% interest, it’s hard to see how anyone could get ahead by borrowing money at 3% or more to invest in bonds. Yet this is what many people are doing, probably without realizing it. Let’s start with the example of the widow Mary whose Investors Group advisor had her borrow $50,000 to invest. Mary’s leveraged portfolio is currently invested 44% (about $22,000) in bonds. She pays 3.5% interest on her investment loan and pays a yearly management expense ratio (MER) of 1.75%. Even if we assume that the bonds will pay 2% to maturity, Mary is losing about $715 per year (pre-tax) on this part of her portfolio. Mary has about $28,000 worth of stocks in her portfolio. On these stocks she pays a blended 2.7% MER and 3.5% on the investment loan. To make up for the $715 loss requires an additional 2.55% return. Adding up these percentages, we find that the stocks must return about 8.75% just for Mary to break even for the year. One thought here is that maybe Mary should have an all-stock portfolio instead of accepting guaranteed losses on the bonds. However, this seems awfully risky. But leverage increases risk as well. If we judge an all-stock portfolio of $50,000 to be too risky, then perhaps Mary should just dump the $22,000 in bonds and leverage $28,000 in stocks. This has about the same risk level as her current portfolio without the built-in $715 loss each year. Of course, the real answer is that Mary shouldn’t be leveraged at all. It simply doesn’t make sense to own low-volatility fixed-income assets in taxable accounts at the same time as having debt. The gap between the risk-free return and the interest rate on the debt makes this a losing strategy. It’s better to reduce debt and hold a smaller portfolio with a higher percentage of more volatile investments like stocks. This reasoning applies whether the debt is an investment loan or any other kind of debt like a mortgage or line of credit. This analysis gets more complicated when we factor in taxes with registered accounts. A very common situation for investors is to have a mortgage at the same time as holding balanced mutual funds in an RRSP. I wouldn’t say that this is always a bad idea, but investors would do well to ask the question of whether they would be better off with a half-size RRSP full of stocks and a smaller mortgage. In late 2006, Mary (not her real name), a 75-year-old widow, accepted the advice of her Investors Group advisor to borrow $50,000 to invest in mutual funds. She has maintained this loan for over 6 years now. Mary is an intelligent woman, but not an experienced investor. It’s easy to see how this move was good for Investors Group, but very hard to see how it was good for Mary. Mary’s recollection is that this strategy was somehow going to save her heirs money on taxes. The only connection to taxes that I can see is that she can write off the loan interest each year. But this just saves her a fraction of the interest; she still has had to pay the rest. The main thing this leverage did was add another $50,000 to Investors Group’s assets under management. As of the end of 2012, this figure has shrunk a little to about $49,800. The hidden management expense ratio (MER) cost on these assets is $1211 per year. After accounting for the tax write-off for interest, Mary has lost $9170 over 6 years. Her average compound return is a loss of 3.0% per year. Over this same period, Canadian bonds rose by an average of 5.9% per year, the TSX rose 2.3% per year, and the S&P 500 lost 0.4% per year. The main reason for Mary’s poor results is the sky-high MERs on Investors Group mutual funds. Mary has paid roughly $7300 in hidden MERs over 6 years. She also has a RRIF with Investors Group where she has paid even more in MERs. However, focusing on Mary’s dismal investment results is a distraction from the more important question of why she was talked into leveraged investing in the first place. In my opinion, leverage is completely inappropriate for her situation. She is now 81 years old and could use the $9170 she has lost. Fortunately for Mary, it will only cost her about another $200 to collapse the loan and investments. If she had collapsed them back in 2008 or 2009, her losses would have been far greater. In my case, this all adds up to about $11,000 of first half-year costs that I don’t have from July to December. If we toss in the RRSP contribution of nearly $24,000 that I’ll make before mid-year and the resulting reduced payroll taxes for the second half of the year (over $10,000), the imbalance grows to about $45,000! The rest of my expenses tend to be fairly balanced across the year. None of this causes me much difficulty because I spend so much less than my full income, but it does explain why my savings grow so slowly from January to June. Readers may wish to consider balance across the year when choosing renewal dates for once-per-year costs. Do you find that your living costs are concentrated in one part of the year? My portfolio consists entirely of index ETFs except for an investment in Berkshire-Hathaway, whose Chairman is Warren Buffett. Every year I read his letter to shareholders because it is so clearly-written and contains many useful insights. His 2012 letter is no exception. Instead of trying to summarize the whole letter, let’s hit some of the highlights. Berkshire-owned businesses “account for 6% of the country’s wind generation capacity,” and will soon “own about 14% of U.S. solar-generation capacity” at a total cost of $13 billion. In response to shareholders who call for Berkshire to initiate a dividend, Buffett explained the economics of using earnings for dividends versus using them for further investment in existing Berkshire businesses, buying new businesses, or share repurchases. As long as Berkshire continues to reinvest profits in a way that drives up per-share value, don’t hold your breath waiting for a dividend. Buffett gives an example to show how Berkshire shareholders are better off selling shares when they need cash than receiving a dividend. Some late-breaking news: Rob Carrick's latest round-up included a mention of my post this week on Handling RRSPs and RRIFs for Low-Income Seniors. Money Smarts does a thorough review of high-interest savings accounts now that Ally is dropping off the map. Tom Bradley at Steadyhand explains the problems with surveys of investor attitudes toward their financial advisors. Canadian Couch Potato looks at the research on estimating future stock returns. I’m content to just use long-term historical real stock returns and their volatility as estimates for the future. The Blunt Bean Counter says you should be careful not to burn the goodwill of someone willing to give you a job reference by having too many employers call the reference. Canadian Couch Potato explains that while Real-Return Bonds offer inflation protection, they can be volatile in the face of changing interest rates. Tim Cestnick explains the tax rules for lottery prizes and other types of prizes. Preet Banerjee interviews an investor who left his advisor and went the DIY route. My Own Advisor explains that an important part of the RRSP vs. TFSA debate is what you do with income tax refunds. Million Dollar Journey brings us one investor’s story of turning around his portfolio. While it’s good to be optimistic about your future, it’s dangerous to think that you’re truly done learning about investing. Many active investors are on a permanent cycle of turning around their investments, getting disappointing results, and repeating. Big Cajun Man takes aim at over-priced balanced mutual funds. Boomer and Echo tell us about 3 credit card products you should avoid.